McLaren is considering reverting to last year's MP4/27 in the aftermath of a disastrous Austrian Grand Prix with this year's MP4/28 chassis. Jenson Button could only manage ninth place at the opening race of the season, while newcomer Sergio Perez finished the Melbourne race in 11th place, missing out on the final point. 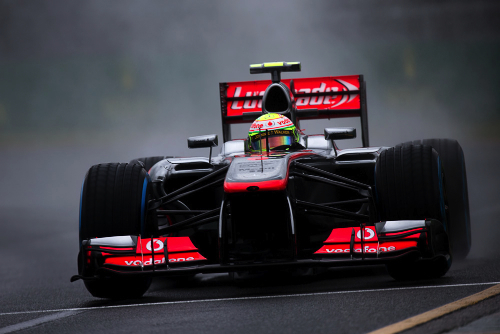 During the entire weekend, in full wet, humid or dry conditions the two Mclaren drivers were never capable of running close to the front of the field, lapping some two seconds off the pace for most of the event. At the end of the Australian Grand Prix, Jenson Button was quick to admit no one is enjoying life at McLaren right now: "In these difficult days, it is important that we make the best of it. Everyone is quite down, because the team are used to winning. I have been winning Grand Prix for four years with McLaren." "You don't enjoy it but you have to have bad times and we must do what we can to get out of this. There have been non-stop meetings and discussions - there is an understanding that it is not OK. We know there are fundamental things that we have to change. We are doing everything we can to improve." Given the lack of time available before the next race, McLaren's management is expecting another difficult weekend at the Malaysian Grand Prix. Team Principal Martin Whitmarsh admitted, "We've got to be realistic. I hope we can make some progress and we're going to be working incredibly hard in the next few days to do that. We've really got to learn about this car, we've got to work these problems out, and we've got to solve it. It isn't good enough at the moment, and that's not a good feeling. I'm sure we'll get it right. We might not get it right as quickly as I would like, but we'll see." "We struggled to have a proper understanding of the car in testing. Winter testing was very strange this year. We knew we weren't coming here with masses of confidence. I think it frankly was a little bit worse than expected. We knew to an extent that this circuit would play to our weaknesses, and I think it certainly managed to do that. We didn't have enough of an understanding to fix the problem yet, but I think we're gaining that. I think you've got to know what you're trying to do, you've got to understand what the problems are, and then you've got to work hard to fix it. Sadly there's no magic, we've just got to work hard now and get it right. I hope that we won't be quite so far off the frontrunners in Malaysia, but I'm not promising that we will be with them either. I think we've got to be realistic about what can be done in the few days before we get there. It's a very different circuit of course, but we'll see." Asked if the team would be considering using last year's car for a few races until the problems with the MP4/28 are sorted out, Whitmarsh said, "That is not a serious option for Malaysia! I think at the moment we've got to work hard on this car. We know it's got some areas of high potential, and we know that it's potentially got more downforce than last year's car. I think there are other issues we've got to understand, and make sure it's accessible." According to team sources, McLaren found out in testing that only running the MP4/28 with a very low ride height they could make the aerodynamic package work, but that was not possible to do in Melbourne due to the bumpy nature of the Australian street circuit. In Sepang it will be possible to run the cars slightly closer to the ground and that should help McLaren be a bit closer to the front of the grid, but there are other issues that prevent the MP4/28 from being a winning car: McLaren is still struggling to understand how to get the most out of the new pull rod front suspension “ that was chosen for the aerodynamic and centre of gravity benefits which brings to the car “ and that is hampering the normal set-up work, as the car is not reacting the team the engineers expected. Using last year's model for the Chinese and Bahrain Grand Prix, that are held in the third and fourth weekends of April, respectively, would give time for McLaren to work on the simulator and on the seven-post test rig with the MP4/28 to try and find the root of the car's problems, before doing a couple of straight line speed runs with it to try and make sure the car could be competitive in the following races, starting with the Spanish and Monaco Grand Prix. For the time being McLaren is fully focused on making the current chassis work to the best of its ability in the Malaysian Grand Prix and only after the Sepang race a decision about what to do for the next two races will be made at a high-level meeting scheduled for next Tuesday in Woking.